How Insane Is The Ocasio-Cortez Green New Deal? The Republicans have been laughing up their sleeves at the Green New Deal proposed by the charismatic but brainless Alexandria Ocasio-Cortez. It has also been archived through the WayBack Machine. As the reader can see, it begins with a lot of flim-flam about climate change which it says is and has been caused primarily by human activity; we can forget about the apocalyptic scenarios of rising sea levels, wildfires, etc. It mentions a so-called racial wealth gap; a gender earnings gap, usually alluded to as the gender pay gap, which was debunked by Thomas Sowell before Ocasio-Cortez was born. This new deal wants to create millions of high paying jobs, to invest in infrastructure, to bring about clean air and water, the elimination of pollution and greenhouse gas emission “as much as technologically feasible”, all this in ten years. It proposes the upgrading of all existing buildings in the United States and building new ones to achieve maximum energy efficiency, all in ten years. 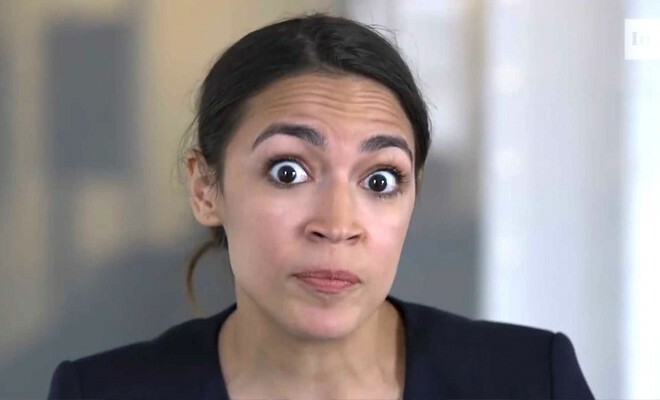 Some commentators have claimed AOC wants to pay people who not only don’t work but don’t want to work, that she wants to destroy the fossil fuel industry, and do away with both regular motor vehicles and airplanes completely. They say she wants to achieve all this by “printing money”, raising the spectre of hyper-inflation. It is easy to laugh at such youthful enthusiasm and gullibility, but older and wiser heads have long concluded we need to enact these kinds of changes if the human species is to survive. And some believe they know how to do it. Firstly, a few specific criticisms, this is not a wish list for socialism; supporting family farming is hardly a socialist goal. Ask any Kulak. Climate change, often seen as the big one. Is climate changed caused primarily by human activity? The reason it is called climate change today instead of global warming as previously is because the people who predicted global warming were the very same people who were predicting an ice age back in the 1980s. Having said that, only a moron would claim human activity does not profoundly affect the environment. The dust bowls of the 1930s were not natural phenomena, neither were the pea soupers of the 1950s, nor are the smogs that hang over China’s modern cities. When Donald Trump talks about “clean coal”, he is deceiving himself, but the idea that the United States and all other major nations need to sign up to some specious international protocol in order to reduce pollution and save the planet is even worse. International cooperation can be achieved without treaties, without the creation of yet another new global bureaucracy that will have the power to pass and enforce laws these bureaucrats consider to be in the best interest of Mankind regardless of their effects on individual communities and entire nations. Job creation is something parties of both extremes and those of the middle constantly proclaim as vitally important both economically and socially, but that is because they are all blind to the real problem, which is people’s livelihood rather than creating jobs for the sake of it. Many extreme right commentators are scornful of the concept of basic income, but this is an idea whose time has come, because only basic income can liberate the underclass. Check out this half hour documentary for a full discussion. It is notable that even Hillary Clinton considered this idea, for her failed 2016 Presidential run, but chose instead to continue to line her own pockets through the RICO known as the Clinton Foundation. The bottom line is that basic income would destroy the poverty trap. Most commentators, including black Republicans, believe welfare is responsible for the state of America’s underclass, especially blacks. The reality is that it is not welfare but the associated means-testing that traps those with low or no skills in poverty. It is also noteworthy that those who enjoy corporate welfare and unearned income seldom if ever have anything to say about how their unearned privilege is detrimental to the nation. Creating jobs for the mere sake of it is easy, start a war! 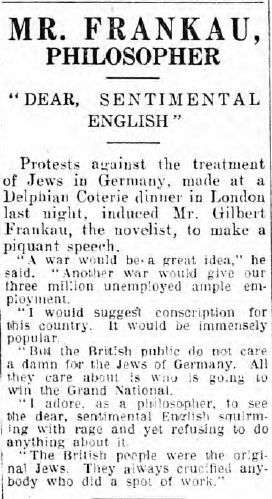 If that sounds absurd, this was the “solution” proposed by Eton alumnus Gilbert Frankau in 1933. That probably didn’t sound quite such a good idea in 1946. Delivering basic income for all as well as funding new infrastructure and technology could indeed be achieved by printing money. No, it would not cause inflation! Printing money for the sake of it would do that. And inflation exists already, primarily because the government borrows money which must be repaid at interest. The Conservative preference is to tax and spend; the socialist preference is to tax, tax, tax…the rich. Excessive taxation destroys investment, and socialist taxation destroys not only the rich but the middle class. Printing money is infinitely cheaper, and can be done electronically with a few key strokes. In fact it is done regularly with a few key strokes through a scam known as quantitative easing. The big difference is that with QE, this money is created out of thin air by the central bank (in the US, the Federal Reserve); it is then given to the banks, who sell it at interest. If this money were spent into circulation by cheap loans to the business community or by free credit (basic income) to the public, there would be no resultant inflation, and a reduction of the national debt. Needless to say, this would be resisted strenuously by the powerful vested interests that both AOC and Donald Trump oppose. What AOC does not and will not realise is that socialism is the problem, not the solution. What we have at the moment is socialism for the banks and capitalism for everyone else. It is finance that needs to be tamed, not capitalism. The bottom line of the financial issue is that provided a government, any government, issues money responsibly and spends it into circulation for productive projects rather than speculation as at present, it can do so with no risk of excessive inflation and no debt. This actually happened during not only the Second World War but the First World War and during many other wars. No government ever lost a war because it ran out of money. Rather, the laws of economics are mysteriously suspended for the duration. After the Second World War, Europe lay in ruins, and Japan’s major cities had been devastated by atomic bombs and firebombing, yet look at them today. In fact, Japan had already been substantially rebuilt within a decade. The issue of credit for this new deal need not be a problem, but what about the technology? The suggestion that aircraft could be replaced by trains has caused not simply ridicule but giggling. So how insane is it? The need for travel has already been reduced massively with resultant saving on costs by the Internet and modern telecommunications. To take just two examples: court hearings in both civil and criminal cases are now often conducted by video-link. All manner of business and government conferences are held likewise which reduces the need for many people to travel long distances. Regarding trains, Taiwan’s high speed train can reach 186mph. The German equivalent can reach 199mph. The world’s fastest train is the Shanghai Maglev, which has a top speed of 268mph. Currently, it takes around 5 hours to drive from New York City to Washington D.C., a distance of around 225 miles. The same journey takes three hours by train, and a mere hour by plane. But travelling by air necessitates a lot of hassle due to security, and did even before September 11, 2001. How much faster would a train have to be to compete with a plane over a thousand mile or even a two thousand mile trip, especially if the cost of travel were reduced significantly? An observation that has been made by many commentators, including the late Irwin Schiff, is that public transport in the United States has been allowed to go to pot due to pressure from the road lobby, certainly outside of the great metropolitan areas. Excellent urban transport could all but eliminate personal road travel, especially if such transport were free to the user. Don’t say this cannot be done because it has, in many places. New technologies can and will of necessity replace the oil, coal and gas industries. Anyone who thinks they can’t or need not, should watch the lecture on arithmetic, population and energy by the late Professor Albert Bartlett. As he points out chillingly, if we don’t solve the problems of population growth and exploding energy usage, nature will solve it for us. Wind power and solar power have their detractors. Wind turbines are said to kill large numbers of birds and to drive local residents crazy with their droning. And when the wind stops…likewise, the Sun doesn’t shine all day, or even every day. These objections are facetious in the extreme; wind turbines can be located off-shore, and if solar panels cannot produce electricity continuously, their energy can be stored. New technologies have been proposed by the Venus Project of the visionary Jacque Fresco, and indeed new technologies are being developed all the time that enable us to not only save energy but to use less of it. The smartphone in your pocket has the power of a computer the size of Yankee Stadium in the 1950s. The most unrealistic thing about AOC’s proposals is her timescale, but the best way to bring them about would to be for her to join forces with Donald Trump to reduce America’s policing of the world. Last year, the Pentagon’s budget was around $700 billion. A hundredth of that could house every homeless person in the United States, after the wall has been completed to keep out all the bogus asylum seekers. And imagine what advances in alternative energies even a $10 billion investment in research might yield.